With the demands of today’s economy, plants are optimizing their existing space to help increase efficiency and operational profitability. Loads are becoming taller, and weights are getting heavier. Plants – and the equipment that supports them – are evolving to meet these heightened demands. By optimizing your space and investing in equipment such as high-capacity reach trucks, you can improve your plant productivity and create cost savings. Regardless of your industry or company size, space is at a premium. To maximize building capacity, plant managers are being challenged to build higher and leverage every inch of available space to make the most of their facility – from floor level to the top beam. 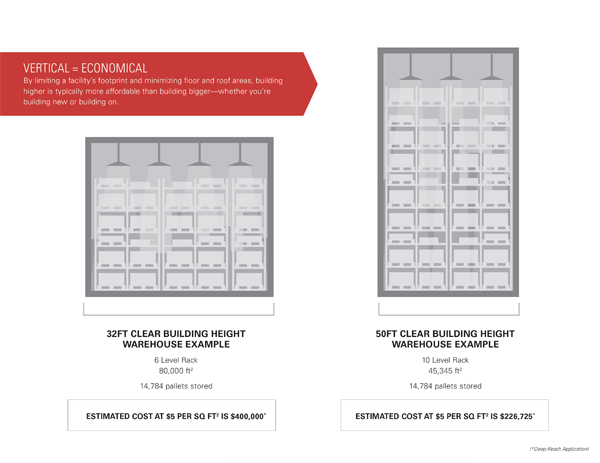 By building up rather than out, you can maximize the number of pallet positions per aisle, which in turn minimizes the cost per pallet stored. A key product differentiator helping plants reach new heights is high-capacity reach trucks, which are designed to reach taller, lift heavier and run longer. This helps provide greater storage and slotting flexibility at a lower cost for plant managers. With higher-capacity reach trucks, you can meet today’s e-commerce demands by utilizing every inch of available space. Standard reach trucks have a 40-foot ceiling height maximum. By opting for a high-capacity reach truck, operators can reach taller ceiling capacities, which expands pallet storage opportunities and reduces annual cost per pallet stored. As e-commerce demands, especially related to the grocery industry, continue to grow, facilities are also starting to build up their cold-storage spaces to maximize the availability of existing buildings and provide for more inventory storage. High-capacity reach trucks can be ideal for these applications. Some trucks with lithium-ion batteries have power packs that include integrated heaters for superior cold-storage needs and thermal controls that reduce the risk of damage caused by environmental extremes. Optimizing existing plant space to build up before you build out can elevate your efficiency. With today’s equipment technology and capabilities, you can meet ever-stricter demands, increase pallet storage opportunities, and lower the overall facility costs of an expansion. Submitted by Susan Comfort, product manager, narrow-aisle products, The Raymond Corp.